Coverage: is defined here as the extent to which a pesticidal spray has been distributed on a target surface. The biological implication is that good coverage increases the probability that a pest will encounter a pesticide. A "rule of thumb" guide to desirable levels of coverage is shown below, (but note that this is primarily based on what is known from application of older chemicals). Because of the relationship between the diameter and volume of a sphere, there will theoretically be a cubic increase in numbers of droplets produced, in relation to their average droplet diameter. Retention: is the amount of spray liquid retained on (mostly the leaves of) crop plants. In other words, it is the remaining proportion of pesticide that has not "run off" (usually high volume spraying) or been eroded by weathering. There is an interaction between formulation effects on the tenacity of a deposit and the surface of the leaf to which it adheres. Droplets often bounce on leaves that are waxy (a property that is often influenced by age) and poor retention may occur with water-based formulations, especially those with high dynamic surface tensions. On the other hand, absorption of active ingredient (a.i.) may occur with oil-based formulations. Leaf exudates (e.g., in apples and broad beans) may also contribute to the redistribution of a pesticide. The next table shows the theoretical coverage on plants if monodispersed droplets (i.e., all droplets have the same diameter) in these size classes were to be evenly applied at the lower limits of the ultra-low, very-low, low, medium, and high VAR ranges for field crops. It assumes that all droplets were captured and retained, and the leaf area index is 1. NR = not realistic spraying scenario (>100% cover represents coalescence of droplets). "Per hectare" application often has very little relationship to the target area to be sprayed: leaf area indices of crops or weeds can range from fractions (pre-emergent weeds at the cotyledon stage) to >5 (late stage cereal crops). With bush and tree crops, VAR per hectare is even more inappropriate, and methods such as the unit canopy row system (UCR) have been developed where sprayer calibration is based on canopy size (Furness et al., 1998). i) size: the volume median diameter (VMD, D[v,0.5], or MMD - mass median diameter): where half of the volume of spray contains droplets larger than the VMD (in µm) and the other half is in smaller droplets. The number median diameter (NMD) is the drop diameter such that 50% of the drops by number are of smaller diameter. The volume average diameter (VAD or D[3,0]) can be a useful single statistic: for describing relatively homogeneous sprays since it can be used to relate droplet numbers to area dose; but unfortunately, like the NMD, it is sensitive to errors in measurement small droplets. In practice, the average droplet volume (ADV): is the total volume of atomised liquid divided by the total number of droplets, measured in picolitres (10-12 litres): so VAD is simply the diameter (in µm) equivalent to the ADV. An approximate value of the VAD can be obtained by calculating the square-root of the VMD multiplied by the NMD. ii) quality: the most reliable statistic is probably relative span, which is a dimensionless parameter calculated from the volume distribution only. As with VMD, D[v,0.1] and D[v,0.9] are diameters representing the points at which 10%, and 90% of the volume of liquid sprayed is in droplets of smaller diameter; the relative span is defined as the D[v,0.9] minus the D[v,0.1] and then divided by the VMD (D[v,0.5]). Some researchers use the VMD / NMD ratio to describe spray quality, but this is unreliable since number distribution statistics (including NMD) are seriously affected by the method of spray measurement. Droplet size spectra can either be displayed as percentage-in class-distributions or as cumulative curves (as shown above). The advantage of the latter is that spectra can most easily be compared - irrespective of the method of measurement used. The X axis, droplet diameter, is usually transformed to a logarithmic scale. The cumulative percentage of droplets (Y axis) is shown as a linear scale, but can be transformed using probit or logit (more easily calculated) functions. This usually gives approximately straight-line regressions over the 1-99% range with monomodal spray size distributions, thus hydraulic nozzle size spectra can be modelled with a log-normal function. The slope of this regression line gives a true indication of spray quality. The spectra of the hydraulic nozzles shown above essentially have similar relative spans and log-normal regression slopes. Innovatory techniques such as CDA improve the precision of spray application and may improve dose transfer efficiency, but modelling the bi-modal size spectra from rotary atomisers is more complicated than with hydraulic spectra. With microbial and other suspended control agents, particle distributions within droplet size spectra must be considered with respect to droplet volumes; this is discussed by Bateman (1993) and Chapple et al. (2000). One method is to display droplet volumes in picolitres with a juxtaposed X scale. The picolitre scale is identical to the particle distribution scale when 1 x 10^12 particles/litre are suspended in the tank mixture; this scale can be shifted right (more dilute) or left, depending on the particle concentration. Spray drift: With placement (localised) spraying of broad spectrum or toxic chemicals, wind drift must be minimised, and considerable efforts have been made recently to quantify and control spray drift from hydraulic nozzles. On the other hand, wind drift is also an efficient mechanism for moving droplets of an appropriate size range to their targets over a wide area with ultra-low volume (ULV) spraying. Himel (1974) made a distinction between exo-drift (the transfer of spray out of the target area) and endo-drift, where the a.i. in droplets falls into the target area, but does not reach the biological target. Endo-drift is volumetrically more significant and may therefore cause greater ecological contamination (e.g. where chemical pesticides pollute ground water) and loss of efficiency. For most people, spray drift refers to exo-drift: one of the undesirable aspects of pesticide application that causes contamination of bystanders, adjacent lands and the environment (see links). It is caused by the winnowing effect of wind: that is more pronounced the smaller the droplets concerned (see table below). 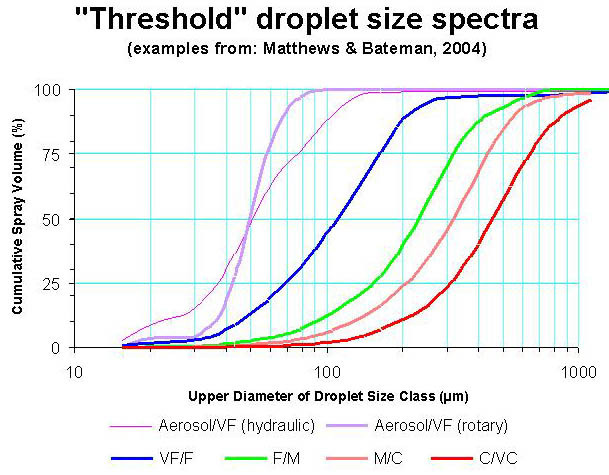 The displacement of sprays is in fact highly complex: for a given droplet spectrum, "driftable" droplets are contained in a number of size classes - all of which are subject to various rates of evaporation (which is in turn influenced by formulation). Natural air flows are also never completely laminar so drift studies are best done empirically in wind tunnels - or ideally - field tests. 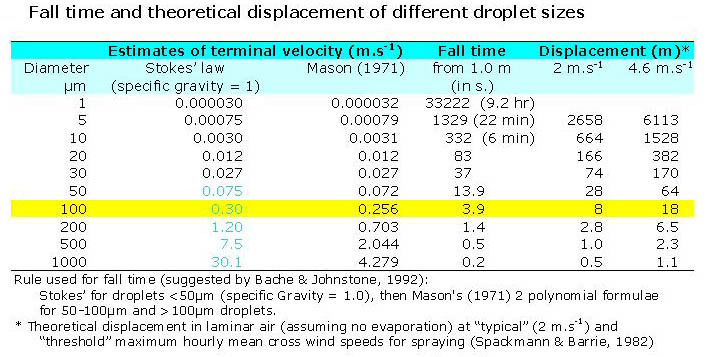 Droplets of >100µm are often described as the "driftable fraction", but as the table shows, even droplets of this size can drift up to 10m in acceptable cross winds. Surface run-off is another environmental issue, that is linked to endo-drift, and may account for substantial contamination of water courses, affecting drinking water quality. Amenity as well agricultural pesticide applications have been implicated, since run off is especially pronounced with treatments to hard surfaces, following rain. Small droplets of water (and other evaporative formulations) reduce rapidly in size, because they have proportionately a larger surface area than larger droplets. Besides formulation, the rate of evaporation is determined by ambient temperature and relative humidity (RH) - and conveniently estimated from delta-T - the difference in temperature between the wet and dry bulb thermometers. 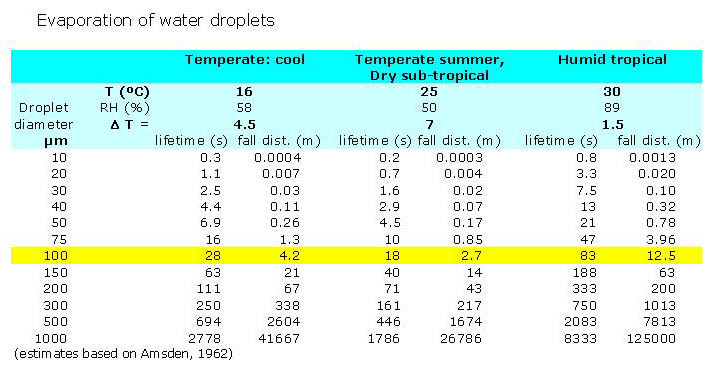 The table below gives the life time and survival distance from the nozzle of water droplets in three representative climatic conditions. The method for calculating RH can be found on Wikipedia. For example much herbicide spraying in cool temperate zones takes place in autumn and spring, and droplets are less prone to evaporation: which has a greater influence on spray drift in summer conditions. Controlled Droplet Application (CDA): is a term probably coined by John Fryer of the Weed Research Organisation in the UK (G.A. Matthews, pers. comm.). Bals (1969) stated that "The efficiency of a spraying machine is inversely proportional to the range of droplets it emits, whilst the suitability for a specific problem depends on the actual size of the droplets emitted". No atomiser is commercially available that can produce uniform (monodispersed) droplets, but rotary (spinning disc and cage) atomisers usually produce a narrower droplet size spectrum than conventional hydraulic nozzles. A span which is substantially less than 1.0 is characteristic of a CDA spray (Bateman, 1993). CDA is therefore best considered in terms of optimising technology to achieve a biological objective: delivering appropriately sized droplets (within practical engineering limits) for maximising the control of a given pest target, (where this is known). Unfortunately, the true biological target is often poorly defined and complex in nature, which when combined with operational variables makes most spraying inherently inefficient. However, there is often scope for improving existing practice (Hislop, 1987). Bals (1969) discussed the concept of producing small uniform pesticidal droplets to achieve adequate control with "ultra-low dosage" combined with ULV rates of application. Unfortunately, this is thought to have discouraged many chemical companies from promoting CDA techniques since sales would be reduced (except when value could be re-added to an a.i. by proprietary delivery systems such as the ‘Electrodyn’: Coffee, 1981). Amsden, R.C. (1962) Reducing the evaporation of sprays. Agricultural Aviation 4: 88-93. Bache, D.H., Johnstone, D.R. (1992) Microclimate and spray dispersion. Ellis Horwood, Chichester, UK. 238 pages. Bals, E.J. (1969) The principles of and new developments in Ultra Low Volume spraying. Proceedings of the 5th. British Insecticide and Fungicide Conference, 189-193. Bateman, R.P. (1993) Simple, standardised methods for recording droplet measurements and estimation of deposits from controlled droplet applications. Crop Protection, 12: 201-206. Chapple, A.C., Downer, R.A., Bateman, R.P. (2000) Theory and practice of microbial insecticide application. In L. Lacey & H. Kaya (eds.) Field Manual of Techniques for the Evaluation of Entomopathogens, 1-37. Coffee, R.A. (1981) Electrodynamic crop spraying. Outlook on Agriculture, 10: 350-356. Furness, G.O., Magarey, P.A., Miller, P.H., Drew, H.J. 1998. Fruit tree and vine sprayer calibration based on canopy size and length of row: unit canopy row (UCR) method. Crop Protection, 17: 639-644. Graham-Bryce, I.J. (1977) Crop protection: a consideration of the effectiveness and disadvantages of current methods and of the scope for improvement. Philosophical Transactions of the Royal Society, London B, 281: 163-179. Himel C M (1969) The optimum drop size for insecticide spray droplets. Journal of Economic Entomology 62: 919-925. Hislop E.C. (1987) Can we define and achieve optimum pesticide deposits? Aspects of Applied Biology, 14: 153-165. Matthews, G.A. (2000) Pesticide Application Methods 3rd Edition. Blackwell Science, Oxford. 432 pages. Parkin, C.S. (1992) Methods for measuring spray droplet sizes. In: Matthews, G.A. and Hislop E.C. (Eds.) (1993) Application technology for crop protection. CAB International, Wallingford, UK, pp. 57-84. Spackmann, E., Barrie, I.A. (1982) Spray occasions determined from meterological data during the 1980-81 season at 15 stations in the UK and comparison with 1971-80. Meteorological Office Agricultural Memorandum No. 933. Meteorological Office, Bracknell, UK.